In ein kleines Dorf, fuer Leute die Ruhe und Erhohlung abseits von Massentourismous suchen. In short, highly recommend it here. Pampos met us at the villa nearby as it is a little tricky to find which is a bonus in my mind. Very secluded, pleasant, and outstanding views. Lovely place. We shall go again. Ich entschultige mich fuer die spaete Antwort. Am Flughaven finden Sie alle Mietwagen firmen, Internationalen aber auch Zypriotischen Firmen. Die sind alle sehr zuverlaessige Firmen. Eine gute Zypriotische Firma ist die "Petsasrentacar" oder die "Cy-Breeze Rentals Ltd" oder die firma "Paforental " . Just back from a wonderful 2 week holiday with my husband and 2 young children. We were met by the very lovely owner Pambos who was very helpful in settling us in following flight delays and lost luggage! The house is an easy 10/15 minute drive into Paphos where there are plenty of supermarkets and restaurants. 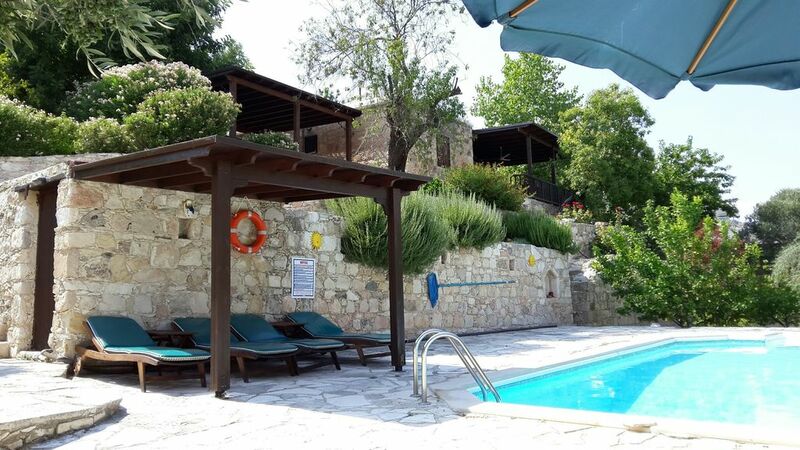 We spent most of our time outdoors in the beautifully well maintained gardens and pool area. The house is surrounded by olive trees, pomegranate, lime and almond trees. The large veranda area offers plenty of eating and relaxing space in the shade. We enjoyed evening swims in nearby Coral Bay and purchased beautiful handmade lace in Omodos. If the weather is particularly hot, we found a visit to the Troodos mountains offered some cooler air - a stop in Platres for lunch is highly recommended! Overall, a wonderful holiday in tranquil surroundings, we can't wait to go back! Very nice and lovely family. It was a pleasure to be there at anytime for them! Large area around the one storey house with lots of chairs and tables. In May the roses (lots) were very beautiful. There are trees and shrubs in the garden and an orchard. There is a large covered verandah to keep cool under (with large fan), also with large table and four chairs AND sofa and two easychairs. Fantastic view. Car port to keep the car cool! Only 15 minutes to Paphos and the Paphos –Limosslol motorway. Easy access to the Troodos. We had a great time. This villa and surrounding area are incredible. The terrace, pool and hammock are breathtaking. Although we didn't meet Pambos, we did meet his brother and father, who couldn't have made us more welcome. Pambos also kept in touch throughout. The village is charming, and also driving to and from the villa provided some tremendous views. Please also visit the coffee shop in the village, the locals make you feel so welcome. Thank you Pambos, your villa is exceptional. If you've already booked this villa you will be aware that the owner (Pambos) is a true gentleman who is only too pleased to offer a friendly Cypriot experience (and Cyprus does friendly rather well). The property is extremely well-appointed although tucked away on a concrete track - our little Kia Piccanto Hire Car coped well with it and the track is never dangerous - it's mostly very wide with frequent passing places. That adds to the seclusion. The villa is very well appointed and everything is good quality and very well maintained. Why have 35 other reviewers also given it five stars - because it really is that EXCELLENT. Note that the wifi is excellent (better than UK superfast broadband), there's a strong mobile phone signal and just one BBC V channel (BBC World) out of about 300 others. Every word describing this property is completely true. All I can say is thank you Pambos for a wonderful, restful stay and for providing such a beautiful and stunning holiday experience. The village is only 15 minutes by car from Paphos, in a fabulous landscape. The sleepy village of Epskopi is characterised by its architecture from past times. Today, its inhabitants are mostly elderly people. It’s a paradise for nature lovers, bird lovers and especially for those looking for tranquillity. A large, steep rock face with a church on top is the landmark of this secluded, unspoilt village. Below the rock, you can see groups of homes on different levels. This carefully furnished house with private pool and Wi-Fi offers tranquillity and recreation off the beaten track as well as privacy. Golf: Perfectly located near the three most beautiful golf courts between Limassol and Paphos. You can reach Tsada Golf Club – in April 2007 reopened and completely renovated – in a 15 minutes drive with an all-terrain car. Tsada is a spectacular course with old trees and was built around an old monastery. Secret Valley and Aphrodite Hills Golf Courses can easily be reached in a 30 minutes motorway drive. Secret Valley, too, is a very old golf course. Beautifully built in a valley, it always has quiet climate, even on windy days. The course is not too challenging so that beginners can have a lot of fun playing here as well. Aphrodite Hills is a spectacular experience for all golfers and does not need to fear comparisons with first-class golf courses in Portugal and Spain. The course is located on various hills so you will need a buggy. However, the rates are twice as high as in Tsada or Secret Valley. This beautiful house is simply perfect for golfers who want to combine its tranquillity and seclusion with the short distance to diverse golf courses.